Offa's Dyke, the great eighth century earthwork of the Welsh Marches is not the border-extending boundary so long imagined. Yet this is the same early medieval landmark feature that later came to define the squat mountainous peninsular that is Wales, as we know it today. But archaeological investigations in recent years have been modifying past ideas about the extent of the line of the dyke on the eastern limits of Wales, though the implications of these surveys and explorations are little understood beyond the confines of scholarly circles. 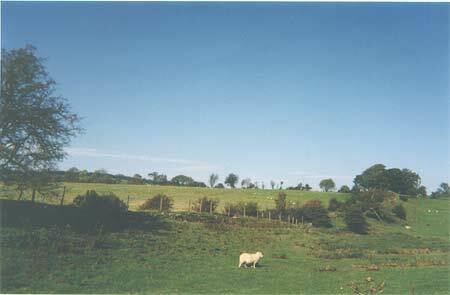 Right: Offa's Dyke near Bersham, Wrexham. (Keith Nurse, October 2003). The misconception may soon be a thing of the past. 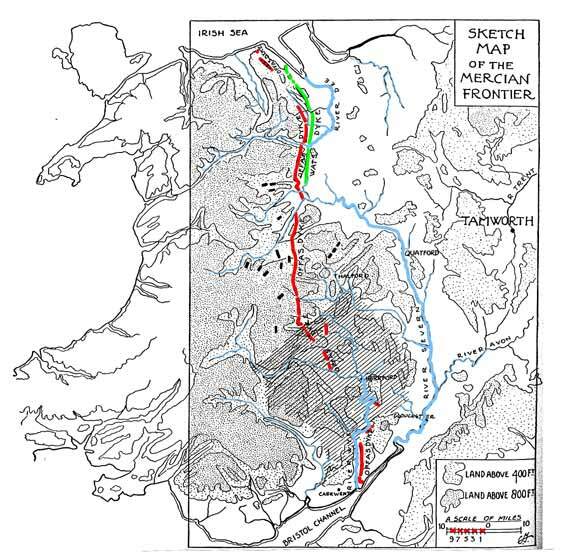 A new (2003) study - the result of years of excavation and field surveying by two of the foremost modern authorities on the earthwork - concludes that the dyke was specifically built as a defensible, though not defended, ditch-and-earthen rampart to counter the threat posed by the Welsh kingdom of Powys. The boundary extended along a lengthy sector of what is now the central part of modern Wales. This was the same kingdom whose early ninth century leaders were claiming a lineage pedigree reaching back more than 400 years to one of the principal fifth century figures of post-Roman Britain, Vortigern (Guarthigirn, in its Welsh form), whose name was inscribed on the celebrated Powysian commemorative monument, Eliseg's Pillar, near Llangollen. 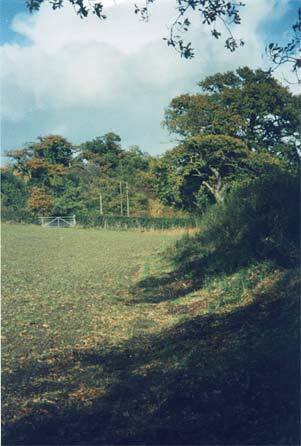 In this northern sector, the dyke follows a still detectable alignment of tree-topped field hedge lines, some six miles to the east. This same green bank and deep west facing ditch earthwork bearing the name of the great Mercian king is visible elsewhere as a sinuous line crossing the hills and vales of an appealing borderland landscape - and in a manner that belies the political strategy that lay behind its planning. But there is much more to it than that: the separateness of Wales is signified by this remarkable earthwork, built more than 1,200 years ago. According to the distinguished Anglo-Saxon historian, F.M. Stenton, the dyke was comparable - in the strength of conception and intelligence of planning - with Hadrian's Wall. It has been also described as the largest archaeological monument in Britain and one of the first great public works of English government - and the most impressive structure of its kind in Europe. Impressive, it certainly is. Centuries of erosion and field ploughing have failed to remove totally evidence of its bank that, in some areas, still survives more than eight feet high, sometimes on upland terrain rising up to 1,200 ft above sea level. It was constructed with a remarkable degree of consistency - almost always following a strategically placed line with wide west-facing views. Offa's Dyke possesses an enduring quality - not only on the ground, but in men's minds. Even today, key sections of the modern boundary of Wales and England follow the line of the dyke constructed on the orders of the monarch who first defined the division on his troublesome western frontier - the same king who, from AD 757 to his death in AD 796, ruled most of Anglo-Saxon England. Where the dyke is still detectable, the modern boundary lies not too far away, though that does not mean to say that Wales was defined as early as the eighth century. The issue was infinitely more complex than that. Contrary to the past conventional view, the dyke was not a peaceful boundary largely defined by treaty and agreement, but a formidable defensive measure to protect Mercia, whose king Offa assumed power after a civil war. In effect, he was watching his 'western back.' He was doing so with good reason. During the parlous opening years of his 39 year-long reign, the Welsh here were on the warpath, reclaiming areas of the western border lands and rendering agriculture and settlement impossible in a string of farms and villages in the outer reaches of the expanding Mercian kingdom. Offa was perhaps focusing on one principal troublesome foe but, indirectly, his 'frontier' arrangements helped define for all time, a small nation. The latest study 'Offa's Dyke - History & Guide' (Tempus, 2003, David Hill and Margaret Worthington) is the most comprehensive and detailed since the work of the late Sir Cyril Fox. Fox carried out extensive investigations of the earthwork from 1920-1930, and his seminal examination set the broad tone of the scholarly approach to the dyke for decades. But in recent years Fox's findings have been extensively modified and his principal conclusions strongly contested. Modern excavations have been carried out by the two authors, who are joint directors of the Offa's Dyke Project that originated from Manchester University's Extra Mural Department. These excavations slowly modified the long-held notion that the earthwork was effectively a border-long frontier line extending from Prestatyn on the North Wales coast to the Wye adjoining the Severn in the south (with acknowledged but explained away gaps). Hitherto, following the 19th century work of the Ordnance Survey the extended line became the 'standard' Offa's Dyke. Sir Cyril Fox effectively confirmed this view on the extent of the earthwork. David Hill and Margaret Worthington: Offa's Dyke and wat's Dyke (2003). Click the map to enlarge. The latter is clearly the same catch-all literary device that was used in earlier times about other defensive features, most notably by the sixth century British monk Gildas (De Excidio) and by the Venerable Bede- circa AD 731). Asser's use of the term 'sea-to-sea', incorporating the word 'usque' for Offa's dyke, was interpreted by Fox as 'all the way.'s. This would give a distance, 'as the crow flies, of some 120 miles'. The new study suggests a distance of half this, the length traditionally attributed to it. The sea-to-sea notion is crucial, with wider implications. Hill-Worthington point out that the Anglo Saxon Chronicle also employed the same phrase to describe the earthen wall ascribed to the Roman emperor Severus (r. AD 193-210). This annal was probably first compiled at the ninth century court where Asser was a leading scholar. Asser, it is argued, may have adopted the terminology perhaps without knowing the location of Offa's Dyke, in an attempt to give an impression of great length. 'We have been hunting a chimera', declare the authors of the latest study. The conclusion of Hill and Worthington is that Offa's Dyke runs almost without a break between the Flintshire village of Treuddyn, south west of Mold in the north, to the last major hills above the River Wye near Hereford. And, secondly, that the eastern limits of Powys bear a striking correlation with the 64 miles of the earthwork as defined and identified by the project team. It was in their view a defensible barrier - a line that may have been reinforced by the use of an early warning system of adjoining hilltop beacons. Between these points (Treuddyn and the hills above the Wye) it survives as a continuous earthwork, except for a length along the Severn near Welshpool. All other earthworks, variously intermittent, fragmentary and of widely differing periods, in the area south of Rushock Hill are landmark features that, mistakenly, have been 'added' to represent a continuing or continuous line that never existed in the first place. Minor kingdoms under Mercian control - an area sometimes known as Archenfield, occupied the area south of Rushock Hill to the Severn Estuary. And here there seems to have been detailed arrangements for the peaceful interaction between the Welsh and the Anglo-Saxons. In the north, between Treuddyn and the Dee Estuary, the territory adjoined those lands of what was, at that point, a not so aggressive or relatively acquiescent kingdom of Gwynedd. After the reign of Concenn, the ruler of Powys who set up Eliseg's Pillar at the head of the Dee Valley circa AD 820, the borderland Welsh kingdom was absorbed by Gwynedd, sometime during the mid-ninth century. But in the 750s, the principal problem for Offa - according to the argument now advanced by Hill and Worthington - was 'virile' Powys. This was the borderland kingdom by then almost wholly confined to 'moor and mountain' whose lamenting bards, lyrically echoing the concerns of their land-deprived lords, long recalled in hauntingly beautiful Welsh poetry. These were the rich sagas - incorporating references to 'dykes' - that recorded the loss in earlier times of the fertile western lowlands of Shropshire. More specifically, the 'frontier' dilemma for Offa was the powerful Powysian king named Eliseg, whose reign seems to have overlapped those of the Mercian monarch Offa in the earlier years. Powys clearly had the ability to launch lightning attacks and raids on outlying Mercian settlements. A decisive and aggressive king, Offa dealt with these threats in a typically decisive manner, ordering the construction of the earthwork. Importantly, the new study also focuses on the significance of the remarkable surviving testimony offered by the Pillar of Eliseg, close to the ruins of the 13th century Cistercian abbey of Valle Crucis - so named after the stone pillar or 20ft high cross. The site, near Llangollen, lies in what were the northern heartlands of ancient Powys. This monument, now surviving just eight feet high and bearing an undecipherable Latin inscription, was set up by Concenn (Cyngen), the last native king of Powys. Concenn died on a pilgrimage to Rome in AD 854, after erecting the pillar to his great-grandfather Eliseg. Right: Eliseg's Pillar near Llangollen. (Keith Nurse, October 2003). The pillar, as now argued by Hill and Worthington, shows that Offa's formidable predecessor Aethelbald (killed in AD 757 after a successful reign of 41 years) had spread his kingdom westwards and colonised some Welsh lands. As for the commemorated Eliseg, he would seem to have been at the height of his power during Offa's reign, possibly sometime in the AD 760s, thus strongly suggesting a cross-border power struggle context for the construction of the defensive dyke along the length of the border shared with Powys. Eliseg's Pillar stands at the heart of it all, set as it is in picturesque steep-sided river valley of undoubted long spiritual and religious significance that reached back into prehistoric times. The monument stands on burial mound believed be of Bronze Age date. Its stone inscription records the descent of its dedicator Concenn - the last of his line - from Britu (Brydu) - son of Guarthigirn (the Welsh form of the name of the fifth century British leader Vortigern) and grandson of the Roman emperor-usurper Magnus Maximus (Macsen Wledig of Welsh legend). Maximus was the Spanish-born general who seized power in AD 383, and the pillar is the only source to name Sevira, his daughter. According to this record, she was Vortigern's second wife and mother of Britu, whose name appears in royal line of Powys. Sevira, however, does not feature in known pedigrees or in later myths; but as her name is rendered in a perfectly normal Latin form, this might in itself suggest that it was no fanciful invention but, rather, had its origins in genuine history. An important side issue arises here, yet one that, oddly, is little understood and disregarded, almost as it is of no consequence - the linguistic dimension to the inscription on the monument. The names of the Powysian ruling house are in the Welsh form, offering further specific examples of name forms observed on monuments elsewhere in Wales. Taken together these confirm that by about AD 800 the Welsh language, evolving from its earlier parent language British/Brittonic, was by then an identifiably separate tongue having shed its British inflexions at least a century earlier, according to the late Sir Ifor Williams. This distinguished scholar argued that Welsh was in fact a language 'fit to sing the praises of heroes' sometime around AD 550. In the early medieval period, Wales was made up of small kingdoms certainly sharing a common language by AD 800. Yet Wales at that stage was not a political entity. But crucially, this was would have been the time when the wild saga tales about Vortigern began circulating widely in the Celtic West - tales in which Vortigern was preposterously demonised. However, it seems, not in Powys. Another argument arises: if Powys was indeed a military and political power, led by a deep-seated and long-held grievance that such a powerful figure such as Offa needed to take massive measures to keep in check - then where did that power come from? Was it an authority that reached far back some 400 years into the post-Roman past, as the inscription on Eliseg's Pillar implies? And did that past represent something of its power, an authority underscored by its Christian context and the invoking of the 'big names' of the late Roman/post-Roman authority - Vortigern and Magnus Maximus? If so, then the more recent argument that the use of the term 'chirographium' with which the pillar's scribe (Conmarch) signed off (a common term in medieval texts for a charter or deed of land entitlement) may be considered further proof of the underlying Powysian inheritance ('pouis inheritadem') claim. An unsettling challenge, one that would no doubt have been have been in everyday circulation long before it was inscribed on stone. The broader significance of that challenge would not have been lost on the politically astute Offa, whose (some no doubt bilingual) advisers would have been keeping a close eye on developments to his west. A sophisticated war-game seems to have been at work here. There is yet another aspect to the argument: the confused early background to Powys and the rivalry with the Welsh kingdom of Gwynedd. 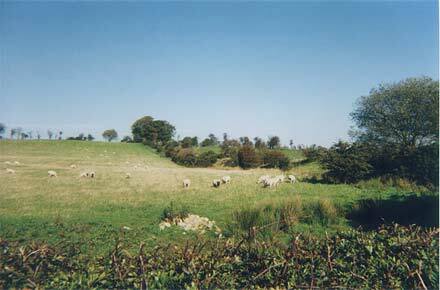 Right: Offa's Dyke on high ground to the west of the border town of Oswestry, Shropshire. (Keith Nurse, October 2003). The early history of Powys is difficult to interpret and the written evidence, such as it is, is at best confusing. And there is now a growing acknowledgement that this evidence reveals later manipulation, principally at work in the 9th century account of the Historia Britonnum (attributed to a Gwynedd-based Nennius), to the detriment of Powys. Nennius and the Gwynedd school of sympathisers - if they can be so called - would have been by writers working almost wholly in the interests of later rulers of the north-western Welsh kingdom. So what does this new, carefully argued Hill-Worthingon study, based as it is on a remarkable degree of examination on the ground, tell us about Powys? It demonstrates, surely, that the Welsh borderland kingdom with its murky background of a dynastic split in the 7th century was a power to be reckoned with. This was certainly so if, as now seems highly likely, it was capable of launching or instigating unexpected guerrilla-style raids along a known and identifiable border that stretched some 64 miles but one that perhaps covered a frontier of disputed land that, in extent, was so much more than that. The other major point that arises from this new examination: two of the most striking monuments of the age - Eliseg's Pillar and the great Mercian earthwork - were in some way inter-connected, at least by the political realities on the ground. In any event, the pillar is crucial to understanding just why the dyke is where it is. Offa's Dyke, its construction involving a huge drain on the Merican monarch's resources and available manpower on his 'western front', could not have been simply an over-reaction to the threat posed by Powys. The dyke, still visible in this area as a direct line trailing along a commanding position the through the Welsh foothills, looks as if it was constructed to deal with an immediate problem, one that presented itself in a specific geographical/political area; a measure that subsequent events soon rendered redundant. Given the consistent state of rivalry that persisted among the Welsh kingdoms of the ninth century, one question remains: why was Powys such a power to be reckoned with? Was it just because of the constant gnawing away at what must have been a vulnerable and exposed frontier along the foothills of Wales, where the Mercians had perhaps over-reached themselves? This suggests another tangential argument: could the construction of the dyke have arisen because of deeper interconnecting reasons? Maybe an acute awareness at the Offan Mercian court of the extenuated Powysian claims to a much earlier form of authority and legitimacy? An authority that the burgeoning Anglo-Saxon kingdom, one with a sizeable Brittonic/Welsh speaking population within its expanding territory, could not ignore - or at the very least felt it was necessary, for reasons that may not have been wholly militarily inspired - it needed to challenge. But why? A piece of legitimate speculation may not be out of order here. Maybe it was because, deep down, the Mercian leaders acknowledged that there was real substance behind the persuasive arguments of the Powysian powermen. 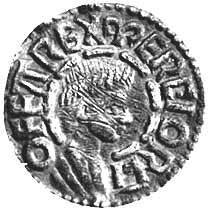 These were inheritance claims invoking the legitimacy of a past authority that led back to Vortigern, a link proclaimed, significantly enough, under the authority of a high standing Christian cross. Wormwald, Patrick, 1982: 'Offa's Dyke' in The Anglo Saxons, 1982, James Campbell, Eric John and Patrick Wormwald, edited by James Campbell, Penguin Books. Hill, David and Margaret Worthington, 2003: Offa's Dyke, History & Guide, Tempus. Asser, Bishop: De rebus Gestis AElfredi (written in last decade of ninth century) ed. Stevenson, W.H. (Life of King Alfred, Oxford, 1904). For discussion: Whitelock, D., EHD (English Historical Documents. vol 1, 2nd edn, 1979. Fox, Sir Cyril: Offa's Dyke, 1955: - A Field Survey of the Western Frontier and Works of Mercia, in the seventh and eighth centuries, Oxford University Press (Introduction, 1920). In his Introduction, Fox observed: "The significance of usque... will not escape the reader - the whole way from sea to sea." The broader issue is worthy of discussion here. When some 700 years later the Crown's administrators (1534/43) set out to define the territory of the newly established shires of Wales and the border, they did so by drawing an arbitrary line that that paid no heed to questions of Welsh language usage or native customs, thus leaving Welsh speakers, settlements and Welsh place-names to the east of the boundary. 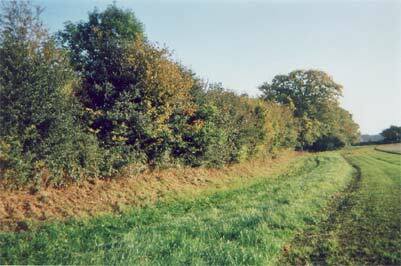 The continuing border nature of the dyke in some areas is demonstrated by the fact that, for one section of the earthwork, the Hill-Worthington team had to seek planning permission for excavation from both English Heritage in London and its counterpart agency, CADW, in Cardiff. Hill, David, Margaret Worthington, 2003: Offa's Dyke - History & Guide (Tempus). Williams, Sir Ifor, 1932: The Beginnings of Welsh Poetry, Studies by Sir Ifor Willians, edited by Rachel Bromwich , 1980, Cardiff University Press - 'The Poems of Llywarch Hen'. In this essay Sir Ifor pointed out that these sagas, Powys-produced, left traces in the topography of Powys and the border. 'Powys produced them, but not in a period of triumph over the enemy; rather, in a period of acute depression, gloom and despair.' p.151. ibid. : 'Welsh has arrived pretty definitely by AD 800'. Corroboration of this, he argues, is provided by Welsh extracts in an Oxford manuscript in the Bodleian (Ox.1) written in AD 820 and by the Welsh form of all the royal names on the Pillar of Eliseg, near Llangollen.' p.11. For a discussion on this see Nurse, Keith (2001): 'Deeds most Ancient', at Vortigern Studies, 2003: http://www.vortigernstudies.org.uk/artgue/guestnurse.htm. For discussion on the background to the Welsh dykes, see Nurse, Keith (2001): 'Wat's in A Name', at Wansdyke Project 21, 2003: http://www.wansdyke21.org.uk/wansdyke/wanart/nurse2.htm. Maund, Kari: 'From Vortigern to Merfyn Frych' - the fifth century to c.825, in: The Welsh Kings - The Medieval Rulers of Wales, 2000 (paperback, 2002, Tempus). The author, lecturer in Medieval Welsh History at Cardiff University, comments: 'The problem of the multiple origins claimed by the differing sources for the dynasty of Powys reflects ninth century propaganda from Gwynedd, but it probably hides earlier traditions in which the descendants of Vortigern, Cyngen and his predecessors, may have ruled over a separate territory to that held by the descendants of Cadell Ddrynllug The question of the origins of the Powyts line - and the likelihood that Powys was formed out of several earlier kingdoms - is further evidenced in surviving poetry, about early Powysian dynasts...'.p.35. 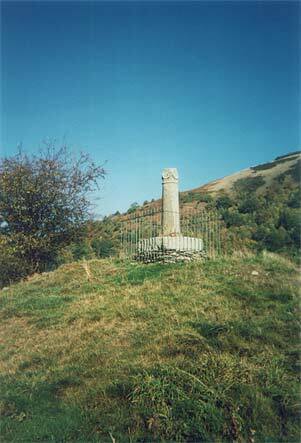 Offa's Dyke - Eliseg's Pillar - Powys Pressure is copyright �2003 Keith Nurse, used with permission.